Walking meetings are a kind of a big deal at LinkedIn. On any given day you can find workers strolling and talking together on the bike path at the company’s Mountain View, California, headquarters. The path takes about 20-25 minutes to circle -- perfect for a half-hour one-on-one with a colleague. The walk and talks have obvious benefits. Desk-bound office workers can all use a bit more exercise. Sitting too much is killing us. Yet the walking meeting’s upsides go far beyond the physical. Walking helps break down formalities, relaxes inhibitions and fosters camaraderie between colleagues -- and less eye contact can fuel more personal conversation. Meeting on the go also minimizes distractions -- no phones, no email, no texts, no colleagues interrupting you. Perisic recounted a time when he and a colleague were trying to solve an issue with LinkedIn’s search function. They spent hours in a room with a white board trying to work it out. Still he felt that he was missing something. You can find many big-shot fans of the walk and talk -- including Facebook chief Mark Zuckerberg, Twitter co-founder Jack Dorsey and this guy named Barack Obama. There’s even a TED Talk devoted solely to the topic. Obama (left) is reportedly a big fan of the walking meeting. We all intuitively understand that it's nice to get some fresh air outside, but new research shines a light on why walking could be especially good in a work environment. When we walk we let our guard down, said Marily Oppezzo, who researched walking and creativity, along with her professor Daniel Schwartz, when she was a doctoral student at Stanford’s Graduate School of Education. Their paper was published online last year in the Journal of Experimental Psychology: Learning, Memory, and Cognition. “Walking releases your filter,” said Oppezzo, now a post-doc at Stanford’s School of Medicine. Ideas you hold back in a conference room come spilling out when you’re moving. To gauge walking’s effect on creativity, Schwartz and Oppezzo had test subjects walk and sit, and then asked them to find alternate uses for everyday items like tires or buttons. One person suggested using a button as a doorknob for a dollhouse, a tiny strainer, something to drop behind you to keep your path, for example. They found that people who walked were able to come up with more unique ideas, both while they were walking and immediately afterward. And, it didn’t matter much if they walked on a treadmill or outside. “Walking opens up the free flow of ideas,” they write in their paper. This doesn’t mean you should convert all your conference rooms into gyms. Sometimes you’re going to need to sit down. The Stanford researchers found that sitting is the better option when you have to solve a problem for which there is only one right answer. For example, they asked test subjects to come up with a single word that combines with the words “cottage, Swiss, and cake.” The sitters were better able to figure out the answer: cheese. 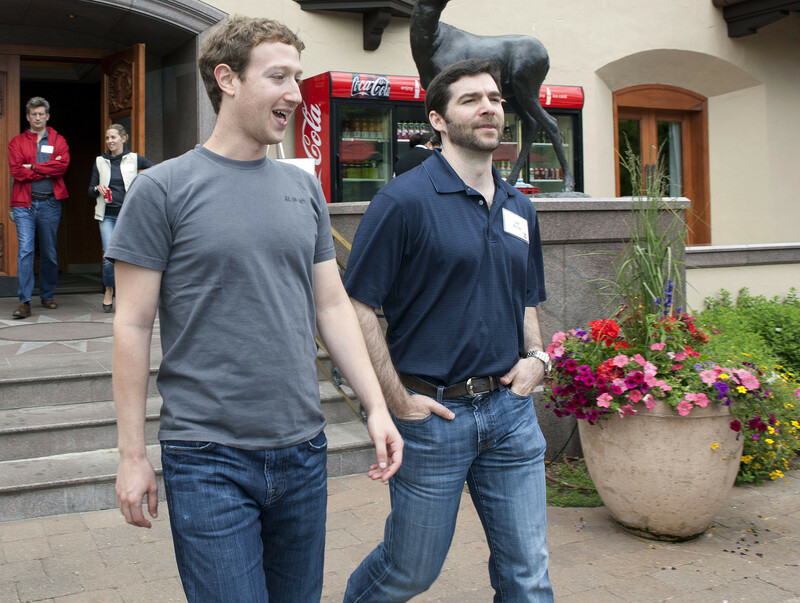 Mark Zuckerberg (left) and Jeff Weiner are both big fans of the walk and talk. Still, Perisic, who oversees about 220 people, can often be found walking with someone on his team. And his CEO, Jeff Weiner, has been positively evangelical on the subject. Other Silicon Valley companies get the whole walking thing, too. Facebook just put in a half-mile loop on the roof of its new headquarters in Menlo Park, California, and workers there do a lot of walking meetings. A colleague suggested walking meetings as a fix -- solve the space issue and get some exercise. “It was very practical,” Weiner said. The company's expanded since then, and it now has more space. But no one’s going back inside.